Sriti Jha is a television (TV) actress. She made her debut with the role of Malini Sharma in Dhoom Machaao Dhoom. Sriti Jha is a currently playing the role of Pragya in Zee TV's show Kumkum Bhagya. She also worked in the serial Jyoti on NDTV Imagine as Sudha Sharma. Sriti Jha was born on February 26, 1986 in Begusarai, Bihar to parents father Mithilesh Kumar Jha (dad) & mother Rita Jha (mom). 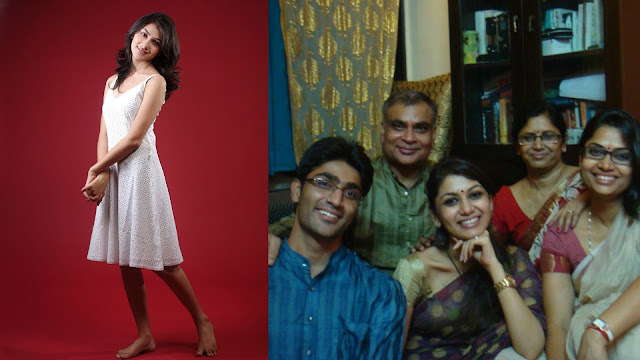 Sriti Jha have an elder sister named Meenakshi Jha Bhattacharya & younger brother named Shashank Jha (Sriti Jha Family). It is so nice to see an actress with their family. It reminds us that they are human after all, that they are the same like us. That despite them having numerous roles to portray at the end of the day, they also have a life to go back to. Having said that, I have to go back to the thing I was doing before I got sidetracked from reading this article, reading paper writing service reviews for my college paper. She is so beautiful! Your posts about television inspires me to blog more at http://writeabook.mywebzz.com/ about cinematography. Thanks a lot for the motivation! Diligent, thorough, assiduous, and patient. These are all significant characteristics that I possess and demonstrate through the quality and content of my work. I've been writing essays for two years and fully understand exactly how to help students succeed within the academic arena.